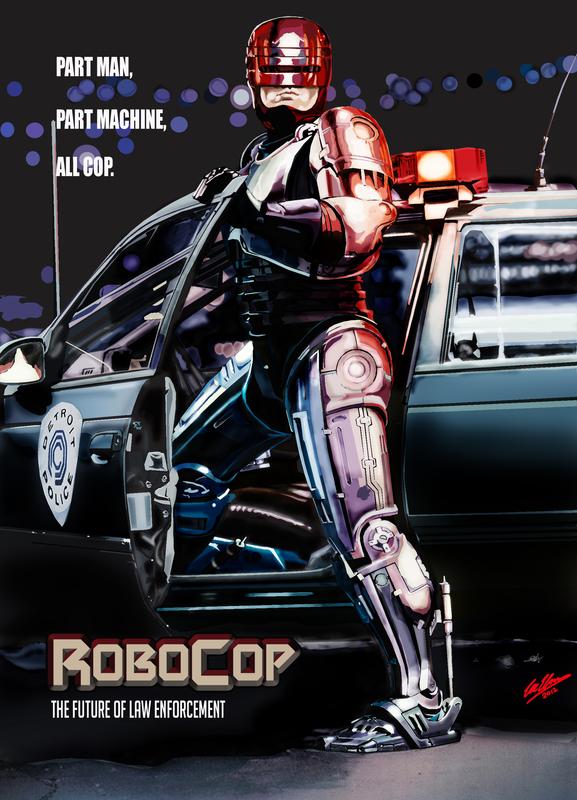 I finally saw the RoboCop reboot a few months ago, so I decided to rematch the original 1987 RoboCop by director Paul Verhoeven and writer Edward Neumeier. Much has been made of Verhoeven’s social commentary in the film. As is typical of 1980s sci-fi films, the villain is a cabal of corporate executives and gangsters obsessed with profit. Through its use of fake TV infomercials, RoboCop pokes fun at excessive capitalism and its intrusion into everyday life. In the film, capitalism dehumanizes people, both figuratively, by treating them as mere consumers, and literally, when Omni Consumer Products takes police officer Murphy’s body and places it in a mechanical suit. The social commentary about capitalism is very heavy-handed, sometimes excessively so. I think part of the problem is that, in showing how capitalism dehumanizes the masses, the film dehumanizes capitalists. RoboCop conflates the phenomenon of capitalism with humans who happen to be capitalists. Capitalism does have destructive properties, but the film makes individual characters the embodiment of those problems. The villains are mustache-twirling psychopaths beyond redemption. They engage in just about every social vice possible. In real life, corporate executives – like regular people – are a diverse group, from the innovative Steve Jobs to the partisan Koch brothers. Its hard to take the social commentary seriously when it paints in such broad strokes. RoboCop is on stronger footing in its portrayal of mankind versus technology. Senior OmniCorps executives seem to believe that technology is the solution to the most ancient of social problems, from crime to healthcare. Sticking a man in a machine is progress; bypassing the man altogether is even better (think of ED-209). Technology dehumanizes the consumer by taking him away from societal engagement. Once officer Murphy is in the RoboCop suit, he no longer interacts with other humans casually. The RoboCop suit both keeps him alive and shields him from the rest of humanity. Later in the film, Murphy struggles to rediscover his humanity. Even though his face is mostly covered by RoboCop’s helmet, actor Peter Weiller does a great job of making you believe that RoboCop/Murphy is experiencing the emotions of loss and pain. This is even more impressive as we never actually see Murphy interact with his family in this film; unlike Murphy, we don’t actually understand the full extent of what he has lost. Unlike its commentary on capitalism (“capitalism is evil”), RoboCop eschews an easy resolution to the thematic question of how man can coexist with technology. On the one hand, the commodification of mankind is permanently but disruptive. Murphy is not simply reunited with his family at the of the film. He will never interact with the rest of humanity as a normal person. On the other hand, the RoboCop suit is not evil; it keeps Murphy alive and gives him superhuman strength. Moreover, Murphy does manage to reclaim human emotions and build new relationships with his human colleagues. Ultimately, it seems that a mankind corrupted by technology is not beyond redemption. Overall, RoboCop deserves its place in the pantheon of sci-fi classics. In addition to the idea of a crime-fighting cyborg, Verhoeven has a unique directorial style that he would later use on other films, such as Starship Troopers and Total Recall. Despite its lack of subtlety in some places, the film does have something important to say about the human condition and can be analyzed on multiple levels.